Established 17 years ago, we have been serving the Surry Hills community and surrounding areas of Sydney ever since. Our commitment to providing the highest quality care in the most friendly environment is as great now as it was on the very first day we opened our doors. Our clients are busy people, we respect their time and we do our best to stay on schedule. We strive to exceed your expectation of chiropractic and health in every possible way. These pillows are made from natural latex, from rubber trees. They are pure latex so they will not sag or loose it’s shape. Therapeutically designed and gently contoured for all sleeping positions and physiques. 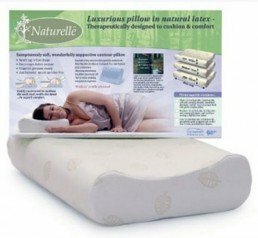 The all-natural, high quality Naturelle latex pillow conforms to the shape of your head and neck to provide support throughout the night. These wonderful pillows never require fluffing, they maintain their shape and provide maximum air flow, preventing moisture and heat build up. Sumptuously soft and support, these latex pillows encourage a restful sleep naturally. They are the world’s best latex pillow! All of us have experienced musculoskeletal pain at some point in our lives, whether that is chronic back pain, acute neck pain or hip pain after an injury. Because so much of our pain and discomfort is caused by everyday activities, many people simply learn to take the discomfort in their stride. Unfortunately, this can mean exacerbating the condition or having to put up with chronic pain in your day-to-day life. Sydney City Chiropractic are seeking to change that with our welcoming and straightforward approach to chiropractic care. Spinal stress (subluxations) can cause impairment to the nervous system, with our Surry Hills chiropractors being trained to locate subluxations by examining the spine. Soft tissue massage and precise spinal adjustments are conducted to ease the pressure on the nervous system, allowing your body to regulate itself correctly. Whether you have been looking for back pain treatment in Surry Hills or are only just beginning to consider chiropractic, you can rest assured you will be in safe hands at Sydney City Chiropractic. Our approach to pain relief is holistic: we don’t believe in numbing your pain with medications or gels, instead focusing on complete pain relief solutions from improving your posture and managing stress to massages and laser pain therapy. Surry Hills locals can rely on us for expert care (we have been servicing the area for over 17 years!) and personalised service with your best interests at heart. We offer a vast range of services at our chiropractic clinic in Surry Hills, including custom orthotics, massage, dry needling and cold laser therapy. Surry Hills residents can turn to us for all their musculoskeletal pain management or healing needs – simply call our clinic today to speak to one of our qualified staff about how we can help you. Seeing that you're here now, you might as well sign up for our newsletter? I have been seeing Michael for over 12 years and every time I have an adjustment I feel like a brand new person almost instantaneously. Highly recommended. It is a delight to go to SCC. The staff are friendly and genuinely caring about your health. Michael is an amazing chiropractor and I honestly do not know where I would be without his services. He gives me constant relief from my ongoing neck and head aches. Service they provide is top-notch. A very clean and caring clinic. Dr Michael listened to my history with ongoing severe headaches and sometimes migraines. He has gone above to attend to me and given follow up calls to see how I am feeling. I no longer have pain killers as part of my daily diet to function throughout the day. I would not recommend Dr Michael enough. A visit to SCC is always guaranteed to sort out my issues. Great attention to detail with massage therapists attending to you prior to adjustments being made. I noticed on my visit an extended range of complimentary treatments available. Very professional and effective treatment. One of the best in the business.